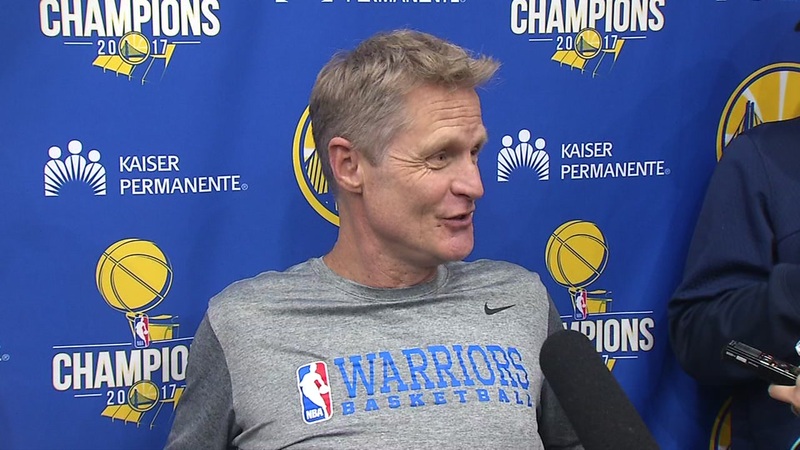 OAKLAND, Calif. (KGO) -- After back-to-back NBA Championships, Golden State Warriors head coach Steve Kerr has yet another reason to celebrate. The Warriors and Kerr have agreed to a new contract extension that will reportedly make him one of the highest-paid coaches in the NBA. "We're excited to have Steve under contract and poised to lead our team for the next several years," said Warriors President of Basketball Operations/General Manager Bob Myers via a team release. "Under his guidance, we've been fortunate enough to win three NBA titles in four years and his ability to thrive in all facets of his job is certainly a primary reason for our success. He's a terrific coach, but more importantly an incredible human being." Kerr was on the final year a five-year, $25 million deal that was signed in 2014. Since putting pen to paper with the Dubs, Kerr has led the team to four-straight NBA Finals appearances and three NBA Championships. He is just the third coach in NBA history to win three titles in the first four seasons with a team, and has the highest winning percentage in postseason history (63-20, .759) according to Elias Sports Bureau. Despite the All-Star-studded roster the 52-year-old head coach leads, his tenure in Golden State hasn't been without challenges. There was uncertainty at times whether or not Kerr was long for this position after complications from a back surgery led to him missing 54 games -- 11 of which in the postseason -- during the 2016-17 season. Kerr was able to return to the bench in time to lead the Warriors to a championship in the NBA Finals that year, and hasn't missed a game since, which gave him the necessary confidence to agree to join the Warriors for additional seasons. Of course, the Warriors were more than happy to have him. Kerr has led the Warriors to a 265-63 record, the best four-year stretch in NBA history, and it was only a matter of time before this deal was agreed upon. Per team policy, the financial terms of the deal have not been released.